Thank You all friends and viewers. 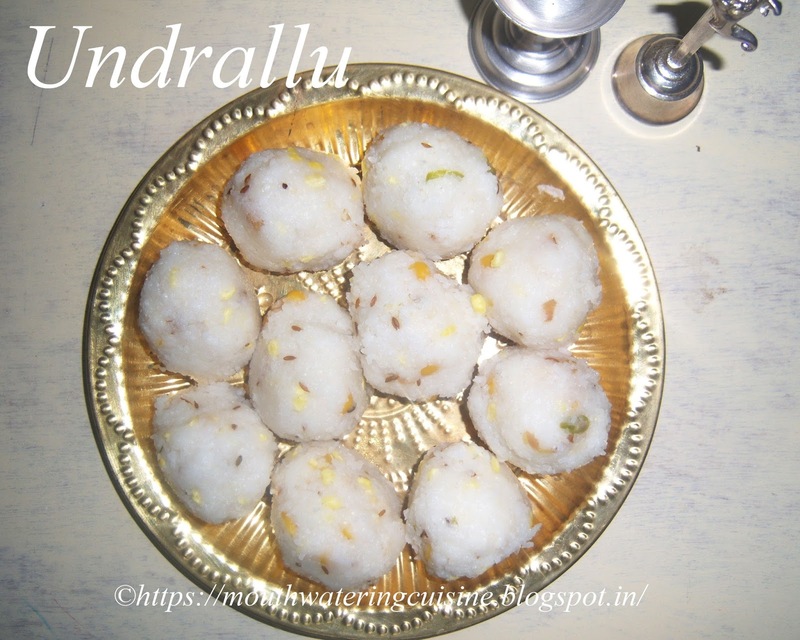 Today I will post how to make Undrallu or kudumulu. They are offered to Lord Ganesh on Ganesh Chaturthi. It is on September 5 of this year(2016). It falls on the fourth day of Bhadrapada Masam of Telugu calendar. We have special dishes to offer on this day. Undrallu, Modak and Panasa buttalu are some of them. I prepare undrallu and if possible panasa buttalu (undrallu cooked in jackfruit leaves). As the leaves are rarely available in Hyderabad. Modak, though I am not perfect, will surely make them in my own style. They may be round or oval shape, but not as exact modak shape. We can use store bought rava to make them. If we are particular about making rava also at home we can make it. Wash rice thoroughly and soak it for an hour. Drain excess water and grind it to make a coarse sooji. Sieve it to remove the fine powder from it. Use the flour for dosa or in anyother recipe which calls for rice flour. Use the coarse recidue as rava. Undrallu made with rice rava. Heat oil in a thick bottomed pan. Add cumin seeds to it. When they start spluttering, add chopped green chillies, ginger. Immediately add chana dal, moong dal and water. Add water according to rava's measurement, we should add 1:2 ration rava and water. Some times if the rava is thicker than usual, add one more cup of water. Allow the water to boil and add salt. When it comes to rolling boiling, stirring continuously add rice rava to it. Mix it well so that no lumps were formed and allow this to cook. Cook this in low flame till the rava cooks completely and we should be able to make laddu or round ball with it. Remove from heat and allow this cool completely. Wet your hands and make small round balls with the cooked rice rava mixture, place them in a wide plate or in idli moulds. Heat idli steamer or pressure pan with little water in the bottom. Slowly place the idli moulds or wide plate in it. Maintain a decent distance between each undrallu. If using idli steamer, then place the plates gently over each other. Do not use force. Steam them for 10 to 15 mins. Cool and serve undrallu with tomato chutney or ginger chutney. Of course only after offering them to Lord Ganesh.